Looking for the best way to manage money for your home or business–for free? If you’re using an old-fashioned system, it’s time to modernize your finances (it’s easy, I promise!). Having an efficient system saves time, makes it easier to monitor expenses, and helps you achieve financial goals. Mint is a free online financial software that makes it easy to understand what’s going on with your money. It’s a dashboard that pulls in updated data from all of your financial accounts–like bank accounts, credit cards, loans, and investments–into one place with one password. Mint is a completely secure connection to all your accounts because it simply reads your data. No one (not even you) can move money between accounts or make a financial transfer. What’s great about Mint is that it automatically organizes your spending into categories—like food, gas, clothes, and rent—and shows you where your money goes in easy-to-understand charts. 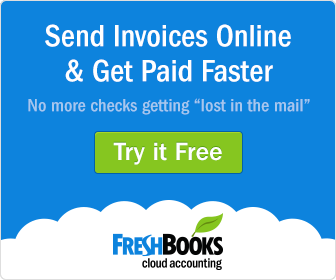 FreshBooks is online accounting software for your small businesses. Over 5 million people have used this service to track time, organize expenses, and invoice clients. It’s a simple interface that’s easy to use–even if you don’t understand accounting. You can securely connect FreshBooks to your financial accounts, import your transactions automatically, and stop entering data manually–which saves a huge amount of time. Click here to take a tour of FreshBooks and get started! Mvelopes is an award-winning online budgeting system that helps you look to the future to manage money. It’s easy to create a budget, track all your spending, and always know exactly how much you have left to spend. You can get started using the Mvelopes Basic plan that’s free. You can upgrade to a Premier plan for $9.95 a month or $95 a year and get additional tools, like an unlimited number of accounts, automatic bill pay, unlimited envelopes, transaction alerts, and 24/7 live chat support.